Congrats, you just went out and bought a fancy new grill! You’ve got it home and even cooked your first delicious steak on it. Now, on your happily full stomach, you are realizing you need to take good care of this grill and make it last as long as possible. It did provide you with delicious food, after all, and you’d like it to continue doing so for a good long time. Plus, it looks pretty good out there on your patio or deck and is either shiny and stainless or a more rugged black cast iron type. You don’t want those to fade or get dirty or stained. What are you to do?? Buy a grill cover of course! Grill covers will protect your grill where you can’t. They will be there for you grill come rain or shine, snow or sleet, wind or sun. They’ll even protect your grill from bird poop. All of that protection means a longer life for your beloved grill and less money spent in the long run on your part. Plus, grill covers are typically very easy to clean – much easier to clean than your entire grill is anyway. But wait – you didn’t realize grill covers were even a thing until you typed into Google “how do I protect my grill? ?” and now you’ve been thrown into a land full of grill covers and are stuck making a choice. On the other hand, maybe you’ve had grill covers before but they let you down for whatever reason. Maybe they weren’t very good quality or faded away in the sun after just a few months. Maybe you had unrealistic expectations for the grill cover that came with your grill and you’re looking for something better. There has to be something better out there, right? Homitt makes a very durable grill cover. It comes in a variety of sizes and is built to withstand all weather conditions while protecting your grill. As an added bonus, it comes with a small carrying bag that you can fold your cover up into and store when not is use. This grill cover is made with 600D Oxford fabric and includes a PVC layer. Those are a lot of foreign terms so in an easier to understand statement: the material this grill is made with is wind and water resistant. It will protect your grill on any day in any sort of weather that Mother Nature can throw at you. In addition, the way that it is sewn makes it rip resistant as well, which further helps protect your grill from the elements or yourself. There are velcro straps on both sides that allow you to tighten the cover so it is snug to your grill. Securing it snugly helps to protect your grill and your cover from the wind by not leaving any fabric flying around when the weather is bad. There are also handles on both sides to assist you in your efforts to get it nice and tight. 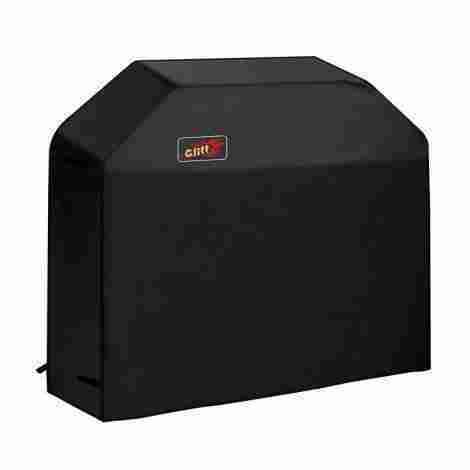 Considering the level of protection this grill cover will afford your grill, it comes at a very good price point. It is inexpensive and will keep your grill in tip top shape for a long time. 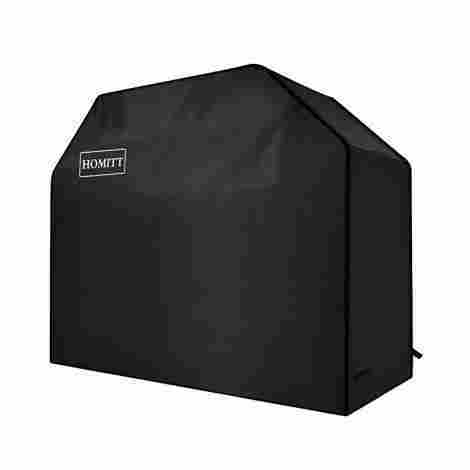 In addition, if you do end up having trouble with your grill cover for whatever reason, Hommitt has very good customer service and will fully refund you within 60 days or replace your cover within 12 months of purchase. When you get a Grill Cover, you want it to protect your grill from all the elements. It needs to be waterproof, windproof, and be able to withstand the sun, or at least protect your grill from the sun. This Victsing will do just that, and if for some reason it doesn't, their Customer Service is very responsive and will send you a replacement cover if yours is faulty. Not all fabrics are created equal. More specifically, not all fabrics are created to protect what it is covering from the harmful UV rays from the sun. This grill cover is designed with a UV coating that many other grill covers lack in order to protect your grill, making it ideal for outdoor use. Since the odds of you needing this cover outside are right at 100%, you certainly want a grill cover that is UV coated. The great thing about this grill cover is that not only is it wind and UV resistant, it is also water resistant. That makes it super easy to clean. It is completely safe to simply spray it down with your hose and let it air dry in the sun. Since it is made to withstand the elements, using a little bit of the elements to help it maintain its clean look and finish is completely acceptable, and even recommended. 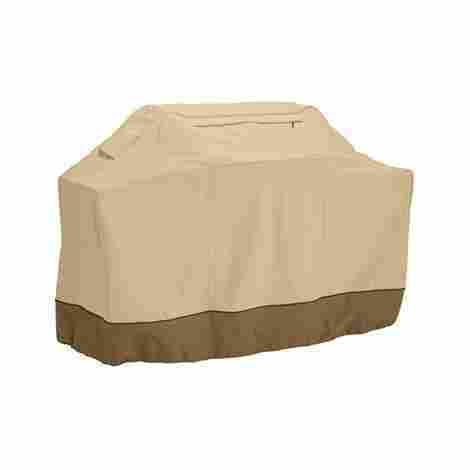 Like others on this list, this Victsing grill cover is very affordable. By barely making a dent in your pocket you will be well on your way to having a more protected grill. Often times you get what you pay for, so don't expect this cover to perform like much more expensive ones, but it will absolutely do the job and do it well enough. As mentioned earlier, if for some reason it doesn't, the company will stand behind your purchase and send you a new one. This grill cover is a step above others on this list and that is seen in the extra features it offers. It comes in a variety of sizes, has attachments straps that will attach to the wheel for an added level of protection on exceptionally windy days, and has a storage pocket in the top so that you can also securely and safely store all of your grill tools in addition to and in the same place as your grill. The Classic Accessories Veranda line features a Gardelle fabric system. That makes this grill cover water repellent and includes a laminated backing. More than that though, the colors are well thought out. Unlike a black cover, this cover is two tone with the top being a light tan and the bottom more of a brown. This serves a couple purposes. The lighter top prevents the obvious sun bleaching that occurs on black grill covers but the darker bottom helps splashes of mud and dirt and whatever else can happen outside from being super obvious. Overall this makes your grill cover look better so you can keep using it for longer without it being an eyesore. Another cool feature on this grill cover is the air vents. Adding air vents allows better circulation inside the cover and helps to prevent moisture buildup. This is especially helpful if you live in an area that is very humid or near water where moisture is more of a guarantee. It also goes a long way to prevent wind lofting. Those things get trapped inside of a non-vented cover. This grill cover will cost you a little more than some of the others on this list, but ultimately you'll be glad you spent the money you did. The quality here is just a little better and the design just a little more thought out so it only makes sense that it costs just a little more money to purchase. It is not expensive by any means and will barely make a dent in your budget. Overall, this is a good buy for the money and will keep your grill covered and protected. Amazon is basically taking over the world and in order to successfully do that, they need to make quality products that people will keep coming back for and recommending to friends. It's basic, really. One of those quality products is this grill cover. Because it is made by Amazon, it ships from Amazon, and you don't have to be worried about any issues there. 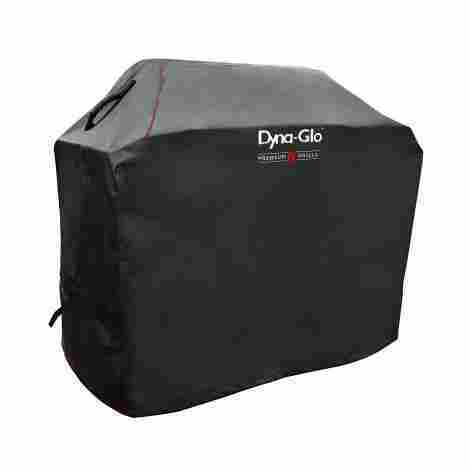 It is a great quality grill cover that will protect your grill from rain, wind, sun, and snow. It has quality fabric, comes in a variety of sizes and colors, and is easy to clean. 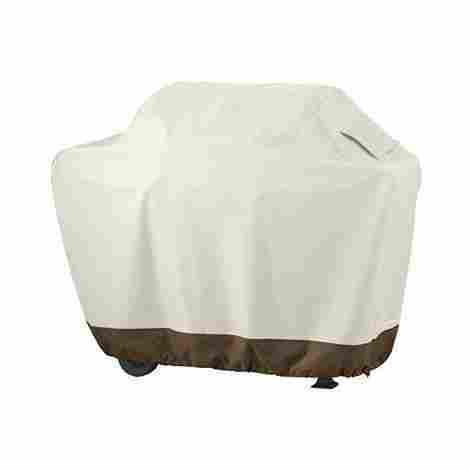 This grill cover comes with a couple of different elements to maximize the protection you get for your grill and the life you can get out of your grill cover. The first is that it is made of 100% woven polyester fabric. That makes it resistant to all of your outdoor elements - sun, rain or snow, and dirt. Secondly is that is comes with tough interlocking seams. What good is a cover if it's just going to fall apart at the seams after only one season? Not much, and not an issue with this cover. When you buy a grill cover, you want to be able to easily put it on and off - especially when it's grilling season. 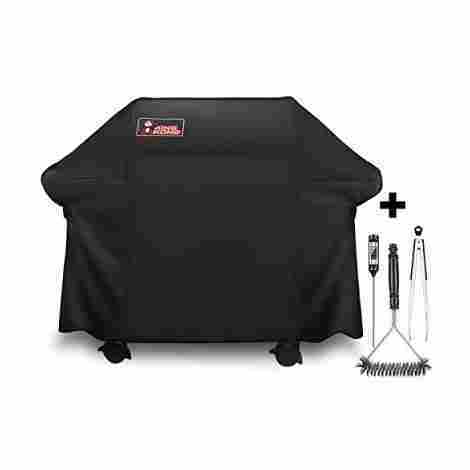 This Amazon Grill Cover is designed with loop handles on either side for easy adjusting and equally easy removal. You don't want to have to fight with your cover when it comes time for the party to start. In addition to the loops, this cover also has click-close straps that lock around the wheel to keep it in place when the wind gets intense. At not much more than the cheapest on this list, this grill cover is well worth its cost. There are more customizable options here than you will find with other covers as far as size and color go. It is easy to use and will last beyond it's first season. Amazon is good at pricing and selling and they are giving you a good deal with this grill cover - particularly if you have access to Prime and can get free shipping! This Char Broil grill is advertised as a medium duty grill, as opposed to the heavy duty grills seen on this list. Do be aware of that and don't overwork it or expect it to perform in extremely intense conditions as it isn't meant for that kind of weather. That being said, it is surprisingly sturdy for being called medium duty. It is made of heavy material and does an excellent job when exposed to sun, rain, and snow. This grill cover comes in a variety of sizes. You can get anything from a 2 burner grill cover up to a 5+ burner grill cover. The quality is the same on all sizes and you won't be disappointed if you are feeding two or feeding twenty. It is particularly good that is has a number of sizes in between so that a more secure fit can be ensured and you don't have to rely on straps to be able to reel in all the extra fabric if you have a small grill or struggle to get it onto a larger grill. 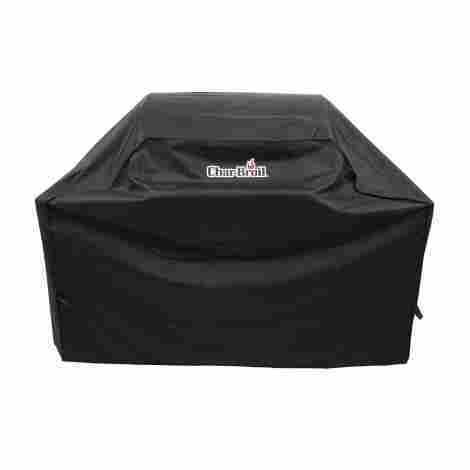 Char Broil makes their All-Season Grill Cover out of 300D Polyester with a PVC inner coating. Despite being rated as a Medium Duty cover, this material allows it to function closer to that of a heavy duty. It is water and wind resistant and is capable of surviving through all sorts of weather - as long as you don't expect it to survive hurricane force winds or the like. This grill cover runs right about par for all the others on this list. It's not too expensive and you won't feel bad buying it. It should be mentioned that others are rated more heavy duty for the same price, so take that as you may. Char Broil is also a more well known brand and makes other quality grill goods so that may be why they are able to charge more as making this purchase is less of a risk. Overall, you are getting a quality grill cover for your money and it surely won't be wasted. Are you one of those people who supports your team in every aspect of your life? Good news! This grill cover will allow you to add one more way to support them. This cover measures 68 inches wide, 21 inches deep, and 35 inches tall. It will nicely fit over a decent sized grill and keep it well protected. The awesomely unique thing about this grill cover made by Rico Industries is that it allows you to support your team while simultaneously protecting your grill. It comes in all NFL teams and the coloring is specific to the team you choose with the team logo being printed on one side for you to proudly display. It will make tailgating parties that much better, particularly when your team takes home the win. Everyone around will know which side you stand on. This grill cover is different than the others on this list in the material used. While others here are made of some sort of polyester/PVC blend, this one is made of vinyl and felt lined. Vinyl is water resistant and will keep the wind and dirt out without a problem. Not that your grill cares, but a felt lining is always nice in the cozy and warm department and will ensure that your cover doesn’t scratch your grill. This unique combination of vinyl and felt will serve your grill protection needs well. In order to get your Football Team specific grill cover, you will have to pay a little more than what you would for others. It is not a large difference, but is one worth noting. The odds are though, that if you are someone who loves your team enough to support them in every way you can, then the few dollar difference won’t even make you bat an eye. You’ll get a good quality, customized cover for not too much money. This seems to be the Mercedes of Grill covers. It is built specifically for the Weber 300 series grills and is guaranteed to fit them. They also come with a generous 3-year warranty, which speaks highly to the quality and construction of the cover itself. It is heavy duty and will serve you well in all weather conditions. Plus, it seems to resist fading despite excessive sun exposure which is a huge bonus. Kingkong constructs their grill cover out of a high-quality polyester blend. It'll give you all the protection of vinyl - water resistant, wind resistant, but also gives you the breathability and pliability of cotton. It'll breathe well when needed, but also keep out everything that you want out. 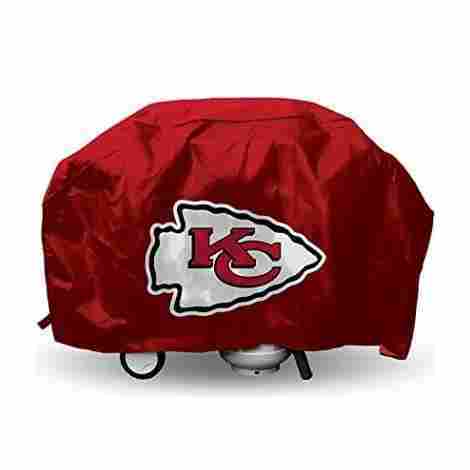 This grill cover will serve you well come rain or shine, snow or sleet, or....you get the picture. It'll keep your grill clean and dry and you happy come summer or winter and whatever harsh weather those seasons can throw at you. What good is a grill without a toolkit? You can't adequately grill or flip a burger or anything else for that matter without the appropriate tools to do so. Sure, you can get away with using standard kitchen utensils, but all that will do is ruin them faster and make you irritated. So, instead of making two separate purchases of a grill cover and grilling tools, Kingkong includes them right along with your purchase of their cover. Included grilling utensils include a stainless steel grill brush, tongs, and a cooking thermometer. Considering all that we discussed above, you are surely thinking at this point "Just how much am I going to be paying for this thing??" It does cost more than others on this list, more than double in some cases, but it is worth the extra money. The included utensils are valued at higher than the cost of other grill covers alone for starters. If you are looking for a serious grill cover that will last you more than a year or two, this is worth the extra cost - and that isn't even taking the utensils into account. If you add those in, you are getting a steal for all that is included in its price. This is another high-quality grill cover. It is made of water and weather resistant PVC Vinyl which combines the best fabrics and ultimately allows optimum breathability and lack of permeability. It is made by the same company who makes the grill it is meant to cover which means they know all the considerations to take into account when building a cover for the grill. That is good news for the life and longevity of your grill cover and with the right amount of care, this grill cover is sure to last you several years at least. 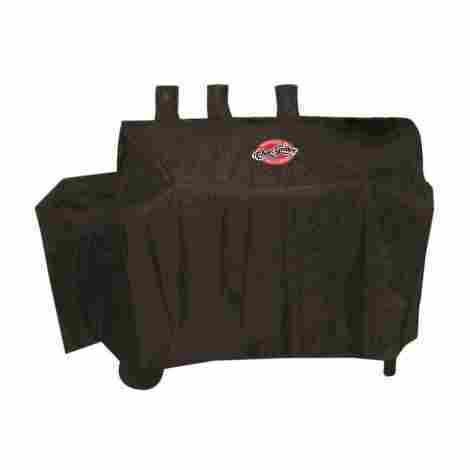 This grill cover is specific to the Char-Griller Duo or Double play and it will fit either like a glove. No need to measure or fret about it not fitting as it should, it will fit wonderfully because it is made to do so. It even includes the option to cover the Side Fire Box, should you choose to do so. You want to keep all of the elements of your grill protected, and this cover will allow you to do so. It is even labeled appropriately so you'll know it is Char-Griller authentic. Every good cover should protect your grill. An even better cover will fit your grill well. But, what exactly is that cover protecting your grill from and will it do the job well? This cover is built to protect your grill from all the elements that can be thrown at it - water, sun, dirt, snow, and bird poop to just name a few. Rest easy knowing that this grill cover has your grill, and by extension, you, covered no matter the circumstances. Like the Kingkong listed above, this grill cover can be pricier than others on this list. To be fair though, this one is highly specific to the large Char-Grill even includes specific finger-like extensions for the smokestacks. That is a lot more detail and attention in production that will result in a higher price point. Ultimately, if you own the right grill for this cover, your money will be well spent here. It'll fit your grill perfectly and last you for more than just a season or two. 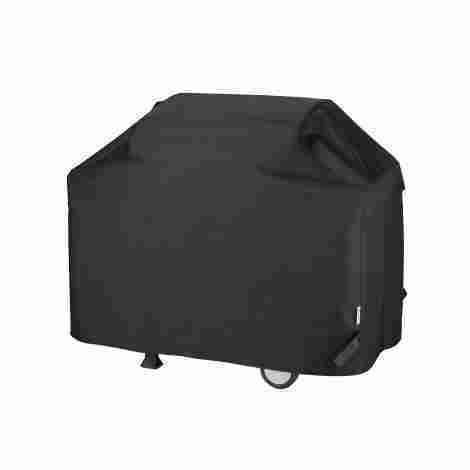 This Unicook grill cover offers surprisingly good and long-lasting coverage for your grill. It is built to withstand more than one years worth of harsh weather. The company has a pretty solid warranty (90 money back and 12-month limited warranty due to manufacturing issues) to back up their product, which is always a promising thing when making a purchase. It comes in a variety of different sizes so you can measure your grill and get the one that will fit it the best and ultimately offer the best protection. Not only is this grill cover built to be weather resistant, it is also built to be fade resistant. There aren't a lot of things more disappointing than having your fancy, new, black grill cover fade to gray or some funky shade of brown within a couple months due to sun exposure. That does not seem to be an issue here. You'll have a pretty, black grill cover for several years that will protect your grill from all things sun, wind, and water. It is always helpful to have a grill cover that comes in several shapes and sizes. While it can be a pain to measure your grill, the added effort is worth the payout. Your cover will fit better, provide better protection, and last longer than it would otherwise. This is especially true when you are purchasing a cover that is meant to be used by a variety of grills. The nice thing about this Unicook cover is that it offers different sizes to fit your different sized grill needs, each with equal quality and satisfaction rates. You can get a grill cover to fit YOUR grill and get the protection that you need. This grill cover runs right along some of the least expensive on this list. That makes it an extra good buy because the quality of this one versus others in this same price point is unmatched. You are getting a steal of a deal here. Your bank account will be happy, your grill will be happy, and you will be happy. Purchasing this cover will mean a win-win situation. This is a very heavy duty grill cover made of quality material and immaculate stitching. It will serve you incredibly well come rain or shine. It is built specifically for Dynaglo grills, but will also work for any grill that fits the dimensions. It comes in a variety of sizes so you can buy the one that best fits your grill. It includes rubber handles on the sides, velcro straps on the bottom, and mesh side vents to better help airflow through the cover. This grill cover is rated as heavy duty, and indeed it is. Others on this list are only 300D or 600D but this Dyna Glo cover rings in at 900 Denier Polyester with the same PVC lining that can be found in others. That ups its ability to be waterproof, rainproof, sunproof, and all around weatherproof. Combine that with the rubber side handles, mesh side vents to prevent moisture buildup, and double stitched seams and you have a grill cover that is meant to last, and indeed will do so. What good is a grill cover if you struggle to get it on and off every time you need to do so? Not much if it just ends up sitting beside the grill or folded up in its carrying pack. Fret not, you will not have that problem with this grill. The side handles are durable and easy to grab and will allow you to lift it up and over no problem - despite its heavy construction. 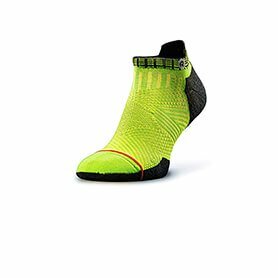 The velcro straps on the bottom will secure it in no time so that you know it is secure and will withstand the wind. This grill cover is easily one of the most expensive on our list. However; it is easily the heaviest duty material used on this list. You pay for quality and that is exactly what you are doing here. You will get a very solidly constructed product made with very heavy duty material that will serve your weatherproofing needs better than any of the other materials used on this list. Do you need that heavy duty of material? Maybe not, but if you do, the money you spend here will be well worth your purchase. A major thing to take into consideration when buying a grill cover is what type of climate do you live in? Do you live somewhere humid – hot or cold or anywhere in between? If you live somewhere humid you already know that mold is part of your life and you need to take any sort of effort to minimize it. That rule most certainly applies to grill covers as it would anything else. It can sometimes be a bad idea to trap all that moisture inside with your pretty metal grill. However; there are steps you can take to minimize the potential for mold growth. For sure you will need to get a grill cover with vents. Your grill will need the ability to let moisture out as much as it will need the ability to let the wind out. Make sure that you wipe it down periodically – and dry it off! If you take these simple steps, you should be in the clear. Just be smart about it, as you are with anything else, and your issues will be minimized. If your climate is dry, you have other things to consider. Moisture is not an issue for you, and you’ll even get away without a cover for the most part. But, weather can get extreme and you’ll still want to protect it, especially if you live somewhere that can get cold in the winter. A vinyl cover is a real option in dry climates because you don’t have to worry nearly as much about moisture getting trapped or the mold factor. Also, dust and dirt can abound when the wind gets to blowing. A grill cover for you will look a lot more like protection from wind and bird poop. Less concerning is the ability to vent and waterproofness. If you are coastal, you will likely benefit most from a grill cover. Weather tends to be unpredictable and violent at times and then there is the salt water factor. It’s a messy situation for your grill. Make sure you cover whenever there is a storm brewing and between uses. Wipe your grill down well before doing so and get a heavy duty cover that will protect it from all the elements. Your grill will thank you and will last you a lot longer if you take appropriate care of it, particularly when the environment is harsh. One of the first things you need to know when looking for a grill cover is what size of cover you need. Some options come in small-medium-large-extra large but some simply have the measurements available in inches. Inches can sometimes be preferable since I can almost guarantee that my large is not the same as your large and that way of sizing leaves the door wide open for interpretation. The good news is that even if they come in small, medium, and large, etc. they usually also offer the dimensions in inches. You just need to get down the reading the nitty gritty fine print to do so. It is well worth your time, however; because you don’t want to go out and purchase your grill cover in the wrong size. That will lead to nothing except frustration. But how do you get the right size? Let us go over how to measure your grill and make sure that it will fit inside the dimensions of the cover you are looking to buy. First, you want to measure the height of the grill. To do so, you need to measure from the ground all the way to the top. If your grill has a chimney or is a smoker type, make sure to include that chimney is the overall height as it will change things drastically and it needs to be covered as well. Do keep in mind that some grill covers are meant to hit above the wheel and the measurements will also reflect that. It may be a good idea to get the height of your wheel as well so that you can account for that if there is a discrepancy or everything you are looking at seems to be just a few inches too short. Next, you want to measure from front to back. Make sure you are measuring at the thickest point. This is usually the part of the grill that is where the handle hits and goes all the way to the back of the grill. If, however; your grill has a little front table that doesn’t fold down or tuck in, make sure you account for that in your measurements as well. Finally, you want to get your side to side measurement. Here you want to make sure that you include all side table and side burners. If you have a firebox, or an attachment include that as well. You want to measure your grill at the point where it is widest. It will do you no good to get a measurement of simply the grill plates, you need to make sure you include everything to ensure a good fit for your grill cover. Another thing to note is the shape of your grill. There are as many different shapes as there are sizes and you don’t want to buy one that is the wrong shape. The best example of this is the Char-Griller. It has smokestacks and a grill that includes them in it that certainly wouldn’t be suited to a grill without them. Be smart. Know the shape and size of your grill, allow a couple inches for breathing room and the ability to get it on and off with a little more ease, and you will be set! All grill covers on this list will absolutely serve your needs. They will cover your grill, keep it reasonably dry, and safe from things the wind can blow in, dirt, and bird poop. Most have attachments to keep it on your grill when the wind gets a little out of hand and some even have considerations for venting the wind should it loft up through the cover. Some grill covers are specific to certain types of grills and others are much more generic and should fit any grill, as long as it is within the dimensions, reasonably well. There are definitely perks to getting a grill cover made specifically for your grill. That way you can ensure that it will fit exactly as it should. It is made to the specifications of your grill, after all. Sometimes, as is the case with all the grill specific ones listed here, the grill cover quality matches that of your grill and will serve you better for longer. You typically pay a little more for it, but when it lasts longer and is replaced less frequently, that becomes a non-issue. For some, this is the only way to go. However; what if you want a little more flexibility in your grill cover? Maybe you are planning on getting a new grill in the next year or so and don’t want to have to get a new cover as well. What if you just don’t like the look or the price of the grill specific covers and want something else? Good news! There are generic ones that will serve you just as well for the first year or two at least. Often times, generic grill covers aren’t meant to last as long and will need to be replaced more frequently. They’ll absolutely serve you well for the first year or two, but after that may start to dry rot or crack, fade, or come undone at the seams. Typically, they can be replaced once and the combination of prices between both purchases will still be less than the purchase of a more grill specific one. Which essentially makes your prices a wash in the long run. If you live in particularly harsh or sunny climates, this may, in fact, be the better option. Lastly, maybe you want your grill cover to express your personality a little more. After all, black gets boring sometimes. There are different color options available and also different styles. Some of the more exciting covers will even include your favorite NFL team logo on them. Ultimately, there is a type of grill cover that will perfectly fit your needs. Whether those needs are super specific or a little more generic matters not. Do your research and weigh your needs with the pros and cons of each type and get the one that works best for you and your grill! Q: Is there a warranty on this cover? A: Some yes, some no. Make sure you read the fine print before purchasing. Most companies are willing to work with you if you get a bad product though. Q: Will this grill cover tear? A: In the long run, yes, all grill covers will tear. However; some will last longer than others. Typically the more you pay the longer the cover is meant to last. Most, even the cheap ones, will last at least a year or two before tearing. Q: Will this grill cover fit my (insert your grill brand here)? A: Most grill covers are made to fit all brands. If not, they’ll specifically say very obviously which grills they are meant for. Make sure to measure your grill and buy the appropriate size. Q: What size of grill cover do I need? A: That wholly depends on your specific grill. Measure it – height, width, and depth (see instructions above) – and find which grill cover size matches your dimensions. Q: Is a grill cover necessary? A: Yes and no. It depends on your climate and how crazy your weather is. If you get crazy weather, it is usually advisable. Q: How often do you use a grill cover? A: Depends on your personal preference. Some only cover during the winter when it’s not in use and going to be facing harsher conditions, but some cover and uncover every time the grill is used. Q: What is the best material for a grill cover? A: Typically a heavy duty, at least 600D Polyester with some sort of PVC lining provides the best all-around protection. Vinyl also does a great job but is less breathable. Q: How do I wash my grill cover? A: Most can be washed either with a rag and dish soap or simply sprayed down with the hose. Q: Why should I cover my grill? A: A grill cover will protect it from the elements and help it to last longer.